Celebrity Edge Preview Cruise, Expectations Exceeded! | What's Up With The Mouse? 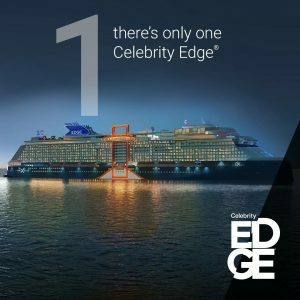 Celebrity Edge invited several guests including travel planners and press along on several 2 night sailings ahead of her public launch this month with regular departures in early December alternating between 7 night Eastern and Western Caribbean itineraries out of Ft. Lauderdale before heading to the Mediterranean during the summer months. I was truly honored and humbled to be included on one of these sailings with less than 1700 onboard each sailing. I am not going to lie- I thoroughly researched the ship before boarding and truly wanted to know what to expect as we only had 48 hours- so my expectations were high. I am happily surprised to report- those expectations were absolutely exceeded. My husband and I have sailed on 5 different cruise lines now- no secret Disney has been our favorite for a number of reasons. Service being the top of that list. I will admit- the team on Celebrity Edge was just as outstanding, if not more, than Disney Cruise Line. With the lack of new itineraries on Disney Cruise Line, Celebrity is absolutely now a great option for those adults or families with older kids- there is a Camp at Sea (which I will show you in a future entry), which does it job. But if there is a negative, it’s that it doesn’t seem to accommodate families as well as the staterooms mostly accommodate 2 guests and the kids’ and teen spaces are very limited when compared to Disney Cruise Line. That said, my husband and I did rebook a week long getaway, by ourselves, while onboard. Why? The entire ship- staff, stateroom, food, amenities, atmosphere were all far above and beyond what we expected and after only 2 nights we left craving more. I am going to absolutely review the ship for you- but it has to be done differently than my previous reviews as so much was packed in 2 days- I want to organize everything for you and be able to show and explain as much as I can. Stay tuned! One Response to Celebrity Edge Preview Cruise, Expectations Exceeded! Pingback: Celebrity Edge Preview Cruise, Final Thoughts | What's Up With The Mouse?